Lake Maggiore boasts the far-famed Isola Bella, perhaps the most elaborate of northern gardens. 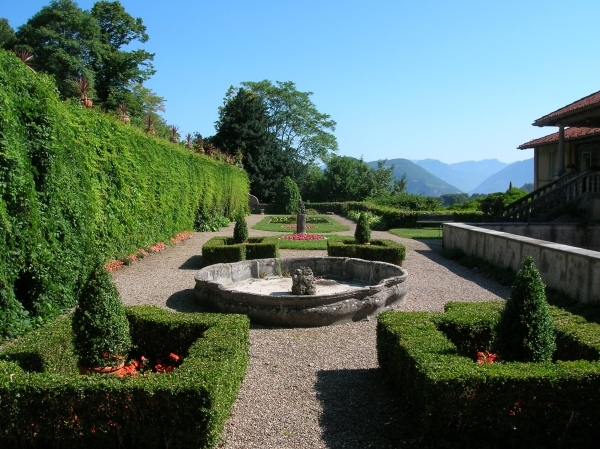 There are remains of gardens at Varese; but the most interesting scheme in this region, with the possible exception of Isola Bella, is doubtless Villa Cicogna Mozzoni, at Bisuschio on the Varese-Porto Ceresio line, not far from Lake Lugano. ROBERT WHEELWRIGHT (January 1914). Established before 1440 as a hunting lodge of the Mozzoni family, it was subsequently embellished and completed between 1530 and 1559 with fresco wall paintings by the Campi brothers from Cremona and their disciples. In 1476 the life of Galeazzo Maria Sforza, Duke of Milan, was saved by Agostino Mozzoni and his dog from the onslaught of a bear, while staying as guest of the family. Such brave act earned favours and fortunes to the family. The garden was established by Ascanio Mozzoni, a man of great culture who from his travels brought back cues for the arrangement of his garden over seven levels. In 1580 his only daughter was married to Giovan Pietro Cicogna through whose descendants we arrive at today’s owners. The most pleasant characteristic of the Villa is its merging with the garden. Almost as if nature, through its vineyard sprouts and flower wreaths, intended to invade the fresco painted ceiling of the porticoes. 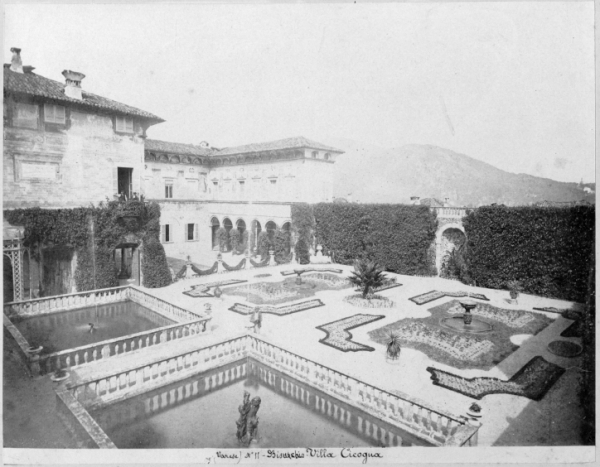 One can admire the two-flight stairway with a brook running in-between which leads directly to the halls of the Villa and also enjoy from above the sight of the beautiful panorama.The walled-in garden is a typical example of formal Italian garden with box hedges, water basins, fountains and a grotto with remarkable waterworks. Climbing towards the belvedere a more naturalistic romantic park follows. Still nowadays the descendants of the Cicogna Mozzoni family are running the estate and taking care of the up-keep. The house and gardens were opened in 1957 and 12 frescoed rooms with furnishing are visible. Today the villa is used for wedding receptions, exhibitions, social gatherings, cultural events and even for shootings location. The house the garden and many of the objects are protected by Italian law and cannot be altered, but the Italian state doesn't give money for its maintenance. Members of Associazione Dimore Storiche Italiane.